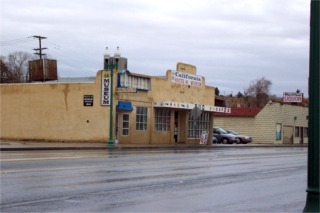 The California Route 66 Museum in Victorville. As you can see it really does rain here in sunny Southern California. The museum has a nice collection of 66 stuff. There is also a library of books you can read, look at or watch video's. Well worth the stop. 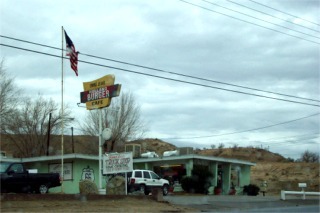 Another Rte 66 diner. We had lunch here. You never know what you are going to get when you stop at one of these places. Sometimes they are very good, sometimes the people are worth the stop and other times... well you forget those. This one was pretty good. We have no idea what this is all about. There were no signs and I can't find any information on this place. But, the entire yard was decorated in bottles. 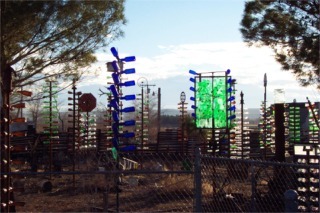 There were bottle sculptures like Saguaro cactus. The whole yard was fenced in and some signs had been used for target practice so you didn't want to get too bold and become someone's target. Not to be missed is the Exotic World Burlesque Hall of Fame and Museum. The place is not an old Rte 66 original but it sure fits with some of the other characters on the road. 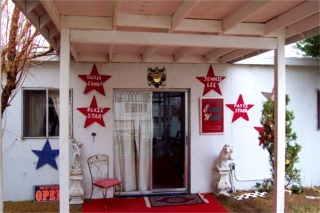 It is run by Dixie Evans whose act used to be a Marilyn Monroe impersonation. The building and grounds are located 3-1/2 miles off of rte 66 in Helendale California. Ohhh Yeaahhh another gastronomic delight. 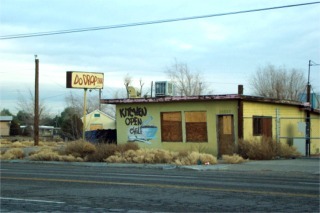 The Do Drop Inn and the sign says the kitchen is open.